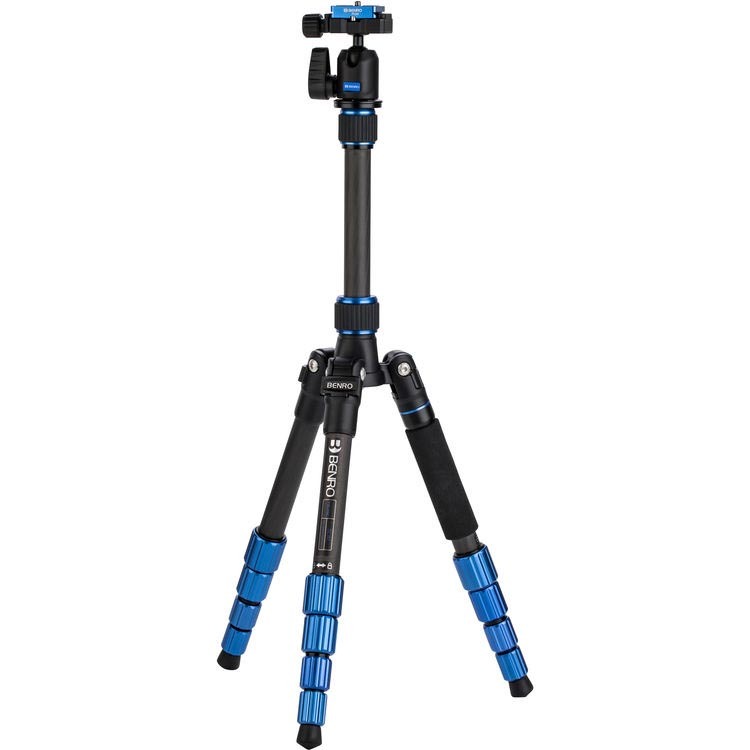 A photographic tripod is not a usual guest on Trailspace, but this one deserves a fresh look from the hiker or cyclist’s point of view. 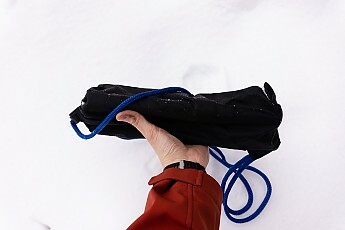 Its main feature is combination of full-scale unfolded dimensions with small folded size (just 2L volume), suitable for bottle pocket in any daypack. Though I almost never took my tripods to any trips because of their enormous folded dimensions and considerable weight. 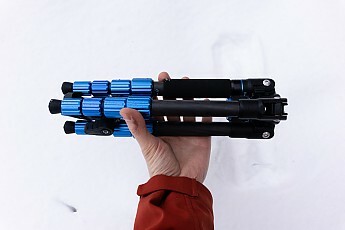 Basically such tripod would occupy the same volume as a small tent, and it was simply impossible to attach it or put inside a daypack. In late 2018 I decided to get a possibly compact and lightweight tripod specifically for mobile usage. Usually the photographers disregard the lightweight tripods, considering the super-stable and heavyweight ones. But for a hiker who’s going to carry his photo equipment among some 20-50 pounds of other gear, the heavyweight tripod is just a dead weight. And in most cases it will reside at home, not in the backpack. To shave some extra grams (but not too much) I decided to spend a bit more on carbon tripod. As long as I shoot with mirrorless cameras, the tripod itself may be not super-sturdy. 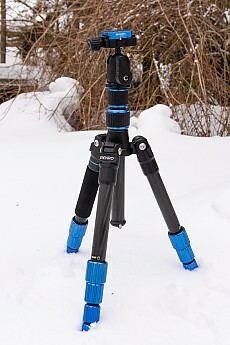 Also in recent years some lightweight full-sized tripods became a lot more compact (shrinking from typical ~50 cm to ~35 cm in folded state), as more complicated design with legs folding by 180° and telescopic middle column gained popularity. 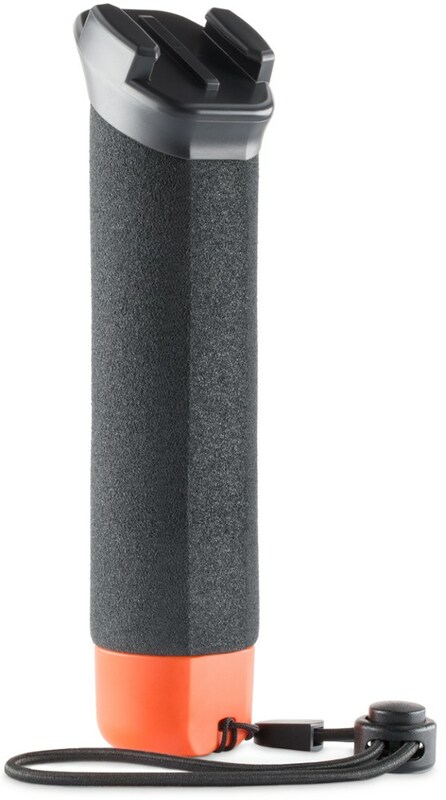 After considering several low-end Chinese manufacturers I ended up on Benro FSL09CN00 carbon fiber tripod, which is made by quite a respected manufacturer and doesn’t cost a fortune in mean time. 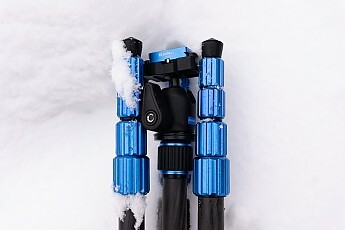 This tripod is equipped with small replaceable ballhead with Arca-style mount (a standard for modern tripods) and carbon fiber tubes. 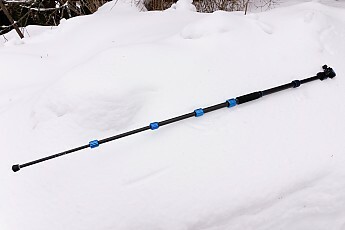 The monopod isn't super-tall either (52 in / 133 cm), but it comes for free. 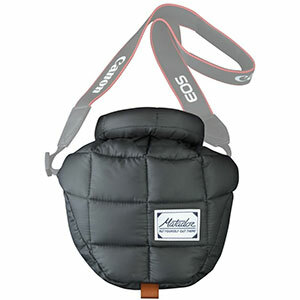 The included pack sack is very nice and lightweight, though minimalistic. There’s no zipper, internal pocket, or padding — only the fabric (looks like 100D) and very thick blue drawcord which also serves as a shoulder strap (if necessary). The quality of every carbon or metal piece is simply great. Everything is machined with great precision and attention to details. I especially like the monopod mode which allows for super-lightweight and low-profile camera setup (especially good for shooting videos in stationary position). 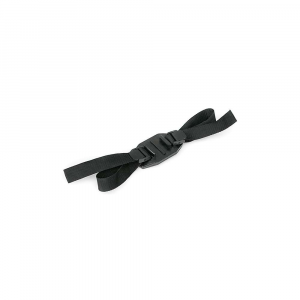 The tubular carbon legs utilize the twist-lock mechanism. 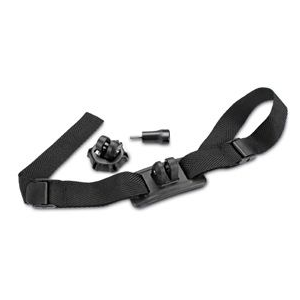 While it looks durable and well-constructed, there’s no positive visual feedback, whether the leg is secured well. So there’s somewhat increased risk of sudden collapsing of leg which wasn’t secured properly. 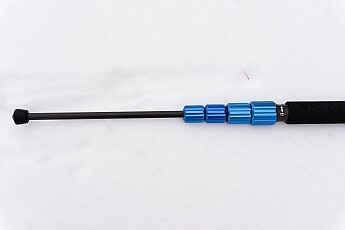 In present time the twist-lock design is very popular among most manufacturers — probably because of better compatibility with tubular carbon legs. It worth mentioning that the included N00 ballhead is quite small, more suitable for lightweight cameras, like my Sony A6300 and A7III (I wouldn’t load it with more than 1.5-2 kg). 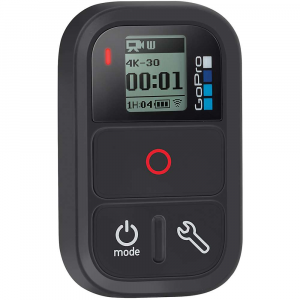 The ballhead also lacks separate panoramic action, when you can rotate the camera around, while keeping it locked in other directions. The tripod legs are quite short, so in many cases you'll need to extend the middle post, which greatly reduces the stability. Finally, the tripod body lacks any bubble level (if this concerns a buyer). 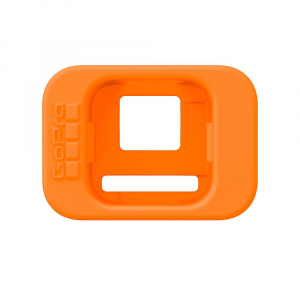 The ballhead has one, but it's located on upper part and normally hidden under QR plate, so it's basically useless. Luckily the ballhead is of standard 3/8" type and easily replaceable. Despite some drawbacks, this tripod is a great traveling companion. 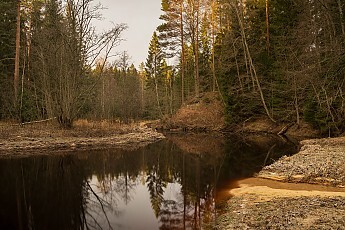 But, it's too unstable for serious photo work with heavy cameras and/or lenses involved. 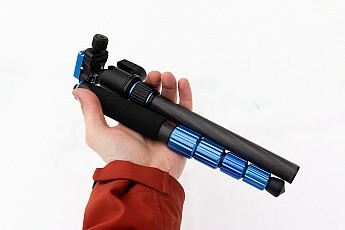 On the other hand, having this tripod in backpack will be much better than leaving a heavier and better one at home. 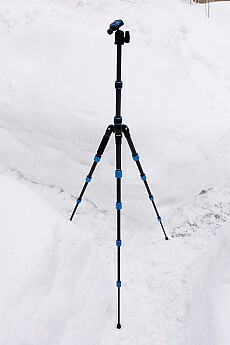 So I can highly recommend this tripod for hikers and other outdoor-oriented people who love photography. 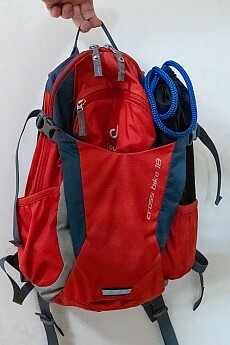 I've owned it for several months, using in several short backpacking trips and many other occasions (not outdoor-related). This is my third tripod overall since 2005. Thanks for the helpful review of your tripod, Vladimir. I've been thinking about getting a lightweight tripod for my Canon EOS Rebel T7i if/when I specifically want to take it on a hike or ski. 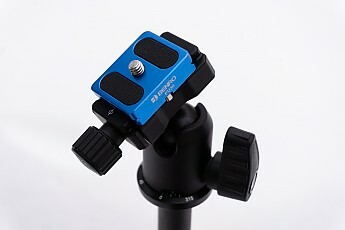 This tripod is viable option for Rebel camera, as well as its aluminum version. The Benro Slim Travel Kit - Carbon Fiber is not available from the stores we monitor.